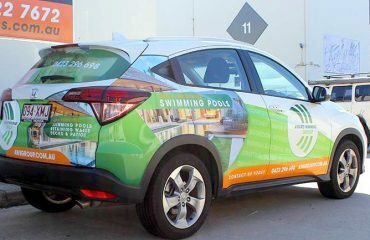 A car signage & car wrap is a big vinyl graphic or decal that is applied directly to the original paint of a car or vehicle. Wrapping a car often involves three stages. The first stage involves creating a unique design to match the taste of the owner. It also involves getting accurate measurements of the car, & the particular pattern or design of the graphic to be applied. 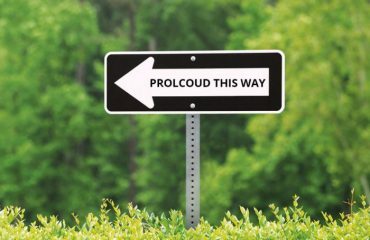 The second stage involves the production of the graphic to be used, as well as lamination to protect the intricate details from external factors. Lastly, which is the installation stage, involves the actual application of the car wrap on the car. Installation of car wraps allows users change the appearance of their vehicle as they wish, & within a very short time frame. It also allows users to remove it whenever they wish, with little to no damage at all to the original paint. Are you considering getting a car wrap over spray painting your car? Here are reasons why you should wrap your car rather than spray paint. A good car wrap job is very affordable. When compared to the regular paint jobs, car wraps are a lot cheaper. Paint jobs cost so much, & they are prone to scratches & fading which naturally means another paint job somewhere down the line. Having to paint your car regularly can take its toll on your finances. However, with car wraps, you can easily remove a torn or scratched part, & have it replaced almost immediately without any significant major impact on your finances. With car spray paints, there is a limit to which a painter cannot surpass. However, with car wraps, the possibilities are limitless. Also, there are a variety of car wrap materials to choose from, giving users a wide range of options to choose from. They include carbon fibre, vinyl, brushed aluminium, velvet, alligator, & snakeskin finishes, etc. With car wraps, you can design anything whatsoever, & have it placed on your vehicle. Achieving this feat with spray paint would seem quite impossible. Car wraps are the only products on the market today that provide consistent finishing. This is simply because we use the latest machines & equipment to make car wraps, whereas, with spray painting, people do the finishing. With spray painting, you have to rely on people to spray your cars to your needs & at the right consistency. Since people are not perfect, any slight change to the immediate environment of the painter can easily render the job imperfect. For this reason alone, car wraps are a better & more ideal alternative to spray paints. A car wrap will provide you with a consistent finish across all the surfaces of your car. Car owners spend a lot of money on their cars every year on wax & cleaning products. This is to maintain the fine finishing that a paint job provides. However, with car wraps, you do not need to spend your money on wax or any cleaning supply for that matter. A car wrap will protect your car from external factors such as dust, dirt, & scratches etc. Car wraps are also very easy to clean. With just a bucket of water & a sponge, you can clean the exterior of your car in less than five minutes. 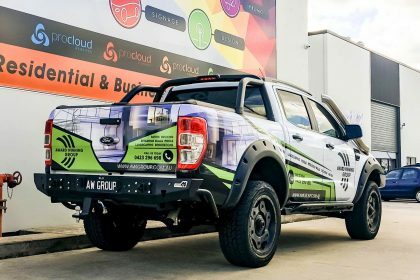 ProCloud Signage designs, prints & installs the best vehicle graphics to businesses in Brisbane. Our vehicle graphics will enhance your brand’s image & promote your business wherever you travel. 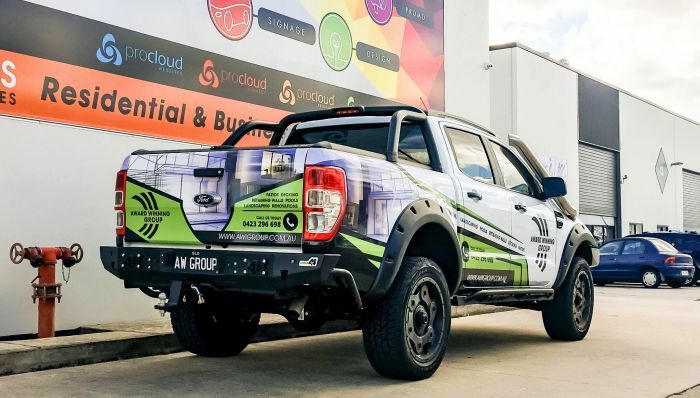 Our team of designers & printers use the latest technology & best printing materials to create outstanding vehicle graphics for your vehicle. From a single car to a fleet of vehicles, we’ll create something to get your business noticed wherever you travel 24/ 7.